Memorial Day usually signals the start of summer. The grills are dusted off, the pools are opened, and the lemonade, popsicles and iced tea become plentiful. In our house, we pretty much grill year-round and one of the things we like to toss over the coals as they are fading, is smoked sausage. This time we served them in buns and topped with a pickled slaw. Stop the presses. That pickled slaw? Out. Of. This. World. The smoked sausages were good on their own but the pickled slaw took it completely to another level, and I found myself wanting one for breakfast the next morning. It was so good, and if you like crunchy-tangy slaw and a little bit of a spicy kick, then this is for you. If you don’t like crunchy slaw and a little kick, this is still for you because it is just that tasty. Next time you have hot dogs or smoked sausage on the menu, do yourself a favor and make this slaw to top them. Your tastebuds will thank you. *Tip: This recipe makes more slaw than you need for one meal, but it keeps well! Just place leftovers in the fridge and use them to top other grilled meat, tuck it into a quesadilla, or just eat it as is! 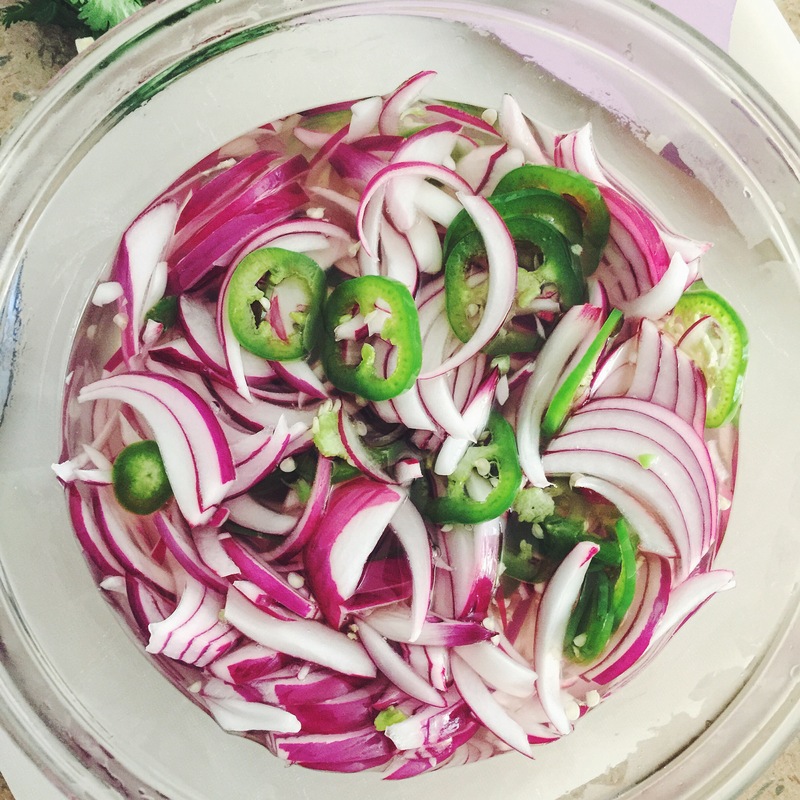 In a medium bowl, place the sliced onions and jalapeños. Set aside. In a medium saucepan, stir together rice vinegar, sugar, salt. Bring to a boil, then carefully pour over the onions and jalapeños and stir gently to combine. Let sit for 30 minutes to allow it to pickle. Place the shredded cabbage in a large bowl. Once the pickle is ready, pour 1/4 cup of the pickling liquid over the cabbage and toss to combine. Drain the remaining liquid off the onions and jalapeños and reserve for another use (refrigerator pickles, perhaps?). Season the cabbage with salt and pepper. Place a smoked sausage in a bun and drizzle with mustard. Place some of the cabbage slaw on the sausage and top with the pickled onions and jalapeños. Top with a little cilantro. Devour. Oh wow, this looks so good! 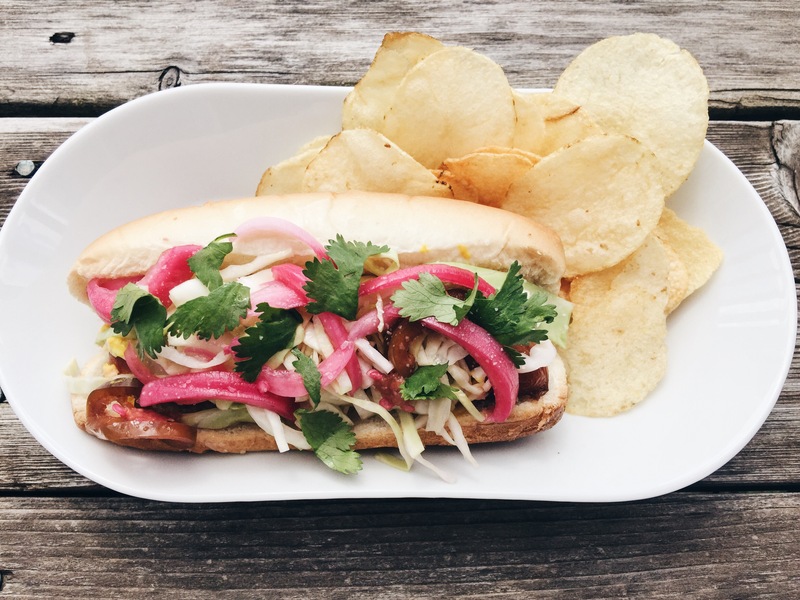 I love the idea of pickled slaw.. and with sausage…you have made me hungry! It is so good! It makes me hungry every time I look at the picture! It looks delicious! My kind of cook-out food!